Norse Sites makes creating a team web site as easy as editing a document. You can quickly gather a variety of information in one place — including videos, calendars, presentations, attachments, and gadgets — and easily share it for viewing or editing with a small group, your entire organization, or the world. Anyone can do it — Building a site is as simple as editing a document, and you don’t need anyone’s help to get started. Share from one place — Create a single place to bring together all the information your team needs to share, including docs, videos, photos, calendars and attachments. Work together — Invite co-workers, classmates, or your entire organization to edit your site with you to keep it fresh and up-to-date. And let as many or few people view your site as you want. To watch a 1:00 minute video introducing Google Sites and what it can do for you, go to http://www.google.com/sites/help/intl/en/overview.html and click on the Play Button located in the center of the page. There is also other information related to Google Sites on this page as well. 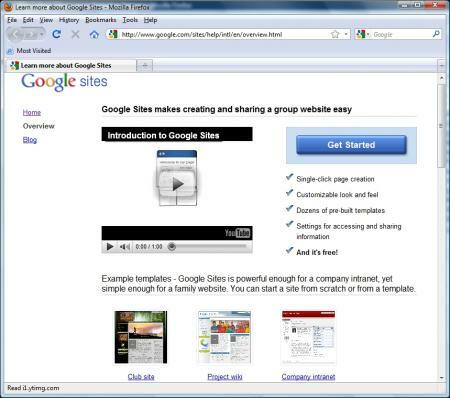 You can learn more about Google Sites at http://www.google.com/sites/overview.html. 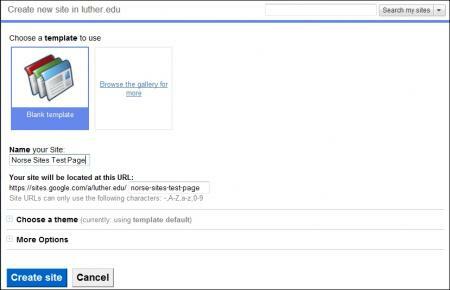 You can access Norse Sites by going directly to http://sites.luther.edu . If you already have a Norse Apps account, you can also access it by starting in Norse Mail, or any other Norse Apps component, and clicking the Sites link in the top left corner of the page. If you do not have a Norse Apps account, contact the Technology Help Desk at x1000 or email [email protected]. Fill in the information about the site. Google Sites has a variety of templates you can choose from, or you can use the default Blank Template. Enter the name of the site under the Name your site box. You can also use one of the themes provided by Google, or use the default theme. Web Page – This is a blank page. 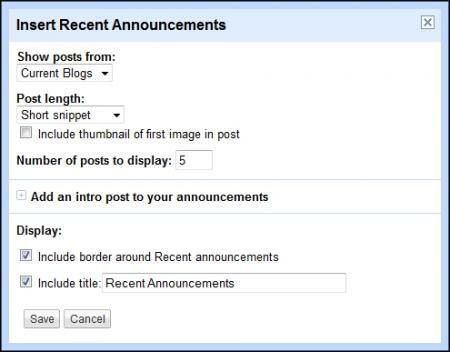 Announcements – This page allows you to create an announcements or blog page. 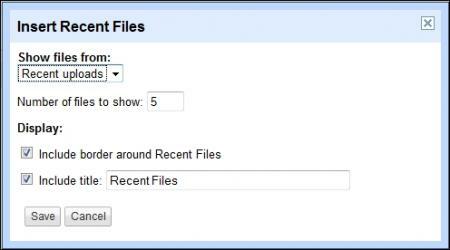 File Cabinet – This page allows you to upload multiple files to the site and have them all managed within this page. List – This page uses different templates but it allows you to show a list of object such as a class roster, listing of assignments or a listing of people that are working on the site. Start Page – This is a per-user start page similar to the iGoogle page. The first text field is the title of the page. The second text field is the body of the web page. The toolbar on the top is the same as a Norse Document. By clicking Insert you can insert a variety of objects including those shown below. 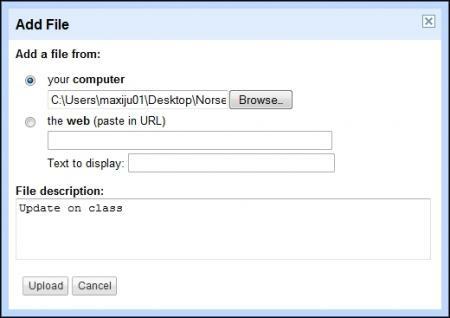 For example, you can link to a youTube video or imbed your Norse Calendar showing your office hours. You could also add a slideshow of pictures from a Google Picasa account. Depending on the type of page, there are other things you can do. For example on the File cabinet page you can add or remove files, and on the Announcement page you can post messages. Once you are done editing your page, remember to click Save at the upper right corner of the page. You may want to work with a bunch of students on creating a Norse Site for a class project. Possibly something that looks like the following. The steps to create this project site are below the image. 1. Click Create New Site. Enter a name for your site. Click on Choose a theme, select a theme that you like, and click again on choose a theme to contract the section. You can also click on More Options to add more details about your site. Next click Create site and the site will appear with a pre-created page. See the previous section “Creating a New Site”. 2. Click on Edit page. 3. Click on Insert > Text Box. 1. 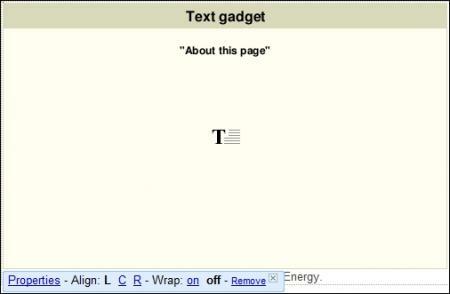 Under Gadget title: where it says Text Box type in “About this page”, which will be the header of the text. 2. The text box at the bottom is where you can write anything you wish. Write the sentence as shown in the image below. 4. Click Create new page. 5. Name the page Current Blogs, select Announcements as the type of page, and click Create page. 6. Click on new post to add a post. The default title is Untitled Post, let’s change it to Hot Technology. 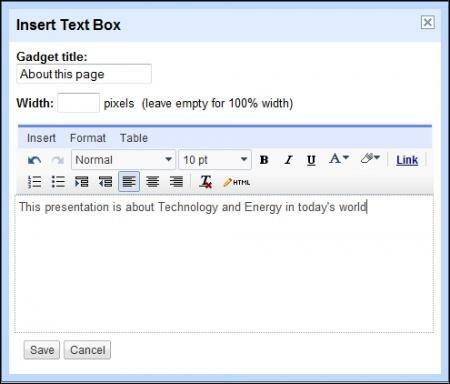 In the larger text box you can write anything you want or copy and paste any link. Once you are done, save the page. 7. On the left side of the page, click on the announcement page you just created, follow the previous step to add more posts. 9. Under the name of your site click the original page that you created (Home page). 10. Click on Edit page. 11. Click on Insert > Recent Posts. 1. Under Show posts from: select the name of the announcement page that you created. 12. Click Edit page> Insert > Presentation. From the displayed window, select the presentation to insert and click Select. Or, copy and paste the URL of your Norse Doc into the text box at the bottom. 1. Make sure you have a presentation uploaded to Norse Docs. Or create a new one with the title The New Era of Efficient Use of Energy and subtitle Norse sites test page, and save it. If you want to use the URL, go to Norse Docs and click on the presentation you want to display on the page. Copy the URL and paste it into the text box. If you want others to view the presentation, you will want to publish it within Norse Docs. 12. Click Insert > Document. 1. Make sure you have a document uploaded to Norse Docs. Or create a new one with the title The New Era of Efficient Use of Energy and subtitle. Use the following link to add a content related to energy sources http://www.alternative-energy-news.info/technology/future-energy/ and save your document. 13. Rearrange your Page. In the edit mode, you can move the items on your original page and align them as you wish. To move an item, click and drag it where you wish to place it. When your cursor changes from a circle with a line in the middle it means that the position of your item will not change if you drop the cursor. When it changes to an arrow with a small rectangle at its end, it indicates that your item will change position if you drop the cursor. 1. Place the Text gadget on top and put Recent announcements right under it. 2. 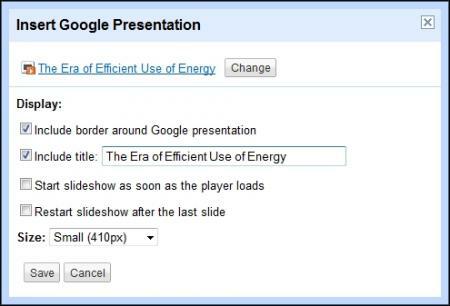 Next place the Google presentation and use the alignments in the top middle of the page to center it. 3. Place Google document last and aligned to the left. 4. Save page. Your site will look something like the Norse Sites Test Page shown earlier in this document. The file cabinet page allows you to take files from your computer, organize and store them on your website. Anyone who subscribes to your website will be notified when you add, change, or remove files from your site. To create a file cabinet and store a file on your site follow the steps below. 1. Click Create new page. 2. 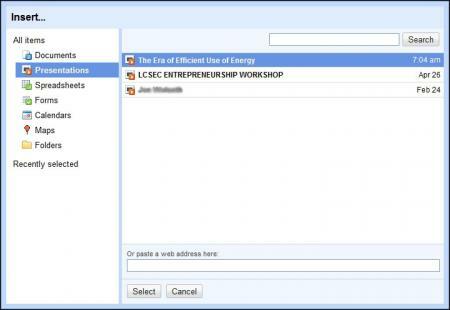 Give a name to your page, select File Cabinet, and click on Create page. 3. Click Add file, browse to your computer, open the file to upload, and click on Upload. Note that you can also upload a file using a URL, and also write a short description of your file. 4. Find the original page you created (Home page) and click Edit page. 5. Click Insert > Recently Updated Files. 6. Name the header of the gadget and select which upload page you want. Using the list page you can organize lists of information. You can add, edit, or remove items on the list, and similar to the file cabinet, subscribers will be notified when items are added, changed, or removed. To create a list page and organize lists of information on your site follow the steps below. 2. Give a name to your page, select List, and click on Create page. 3. You are provided a group of templates you can choose from, click on the last one create a custom list to create your own list. 4. Change the name of the first column in the box under column name. 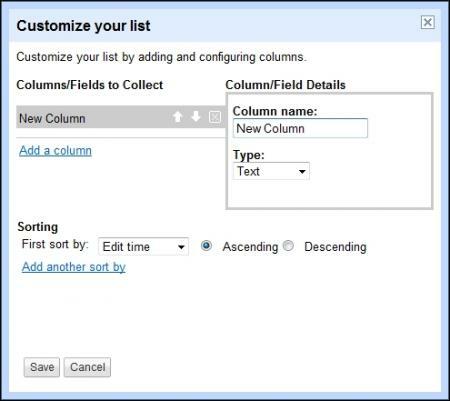 To add a new column, click on Add a column. Use the Type box to indicate the type of information that will be displayed under a column (Checkbox, Date, Dropdown, Text, or URL). Create a list that looks like the one shown below. 1. 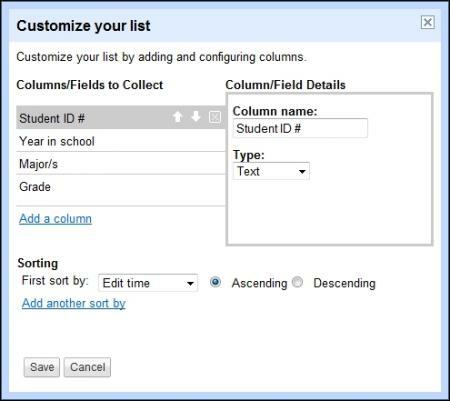 For the Year in school column, choose Dropdown as type, enter the different options (FR, SO, JR, SR). Click Add another to add another option. 2. Create a Major/s column of type Text. 3. For the Grade column, choose Dropdown as type, enter the different options (A, B,C, D, F). Click Add another to add another option. 6. To enter a record, click on Add item, fill in the information, and click on save. 7. Find the original page you created and click Edit page. 8. 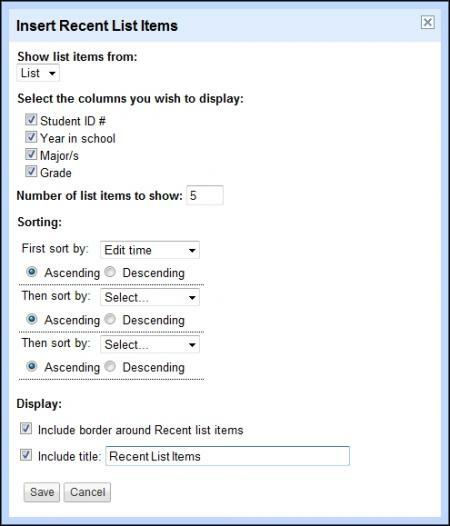 Click Insert > Recent list items. 9. Select which upload page you want and check the columns to be displayed. The start page can be personalized by each viewer. Changes made by site collaborators will be seen by subscribers in a separate section. 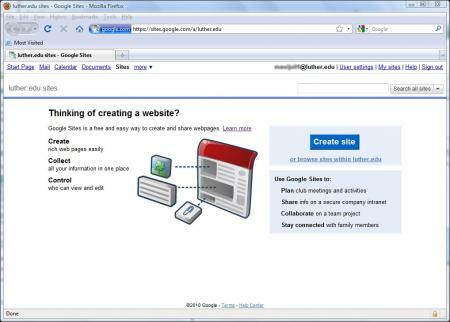 An example of start page is iGoogle. To create a start page on your site follow the steps below. 2. Give a name to your page, select Start page, and click on Create page. 3. Click on Add personal gadgets. Use the sidebar on the left, or the search box to search for gadgets you are interested in having on your site. Click on the gadget, and click on select. The gadget will be added to your start page. On January 5th, 2011, there were changes to our Norse Apps account infrastructure that allow access to other Google services beyond the core suite of messaging and collaboration apps. This change lets users access many new services such as Blogger, Reader, Google Voice, Maps ,YouTube, SketchUp, and Picasa Web Albums from their Norse Apps account. For a detailed list, see More Google applications for your school. Technology Help Desk maintained by Diane Gossman. Page last updated on 9 July 2018.